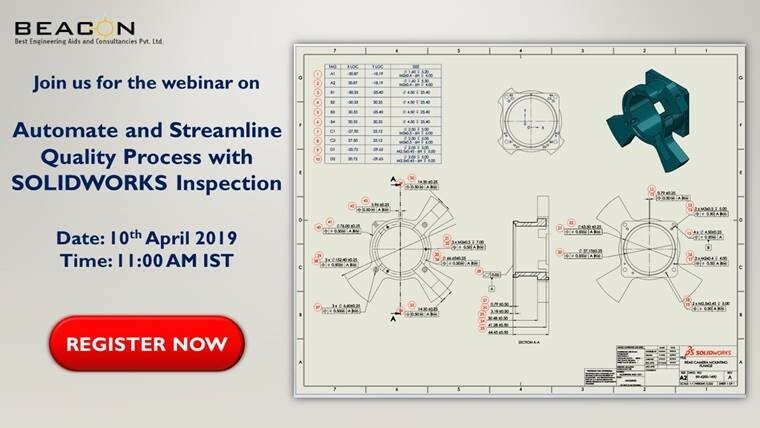 Join us for SOLIDWORKS Inspection Webinar to see how to stop wasting time and effort with conventional inspection methods. Title : Automate and Streamline Quality Process with SOLIDWORKS Inspection. Though producing inspection documentation can be a lengthy process, ensuring the highest level of quality always is paramount when it comes to designing industrial equipment. SOLIDWORKS® Inspection dramatically reduces the time it takes to produce Inspection documentation by streamlining and automating the creation of ballooned inspection drawings and First Article inspection reports. JOIN THE WEBINAR to learn more about how SOLIDWORKS Inspection enables Industrial Equipment manufacturers to produce higher-quality products faster, while accelerating time to market.